Growing up on Chicago’s South Side, Tiffany Mikell had little choice but to become a self-directed learner. As a poor student with few opportunities handed to her, she figured out at an early age that the things she learned from her teachers wouldn’t be enough to help change her situation–and the situation of those around her– for the better. Mikell and her sisters created reading lists and visited the library weekly, as well as local museums on all the free days. They sacrificed new clothes in exchange for piano lessons and had family discussions about the importance of economic development in our community. If something wasn’t taught in a course, they figured out a way to obtain the knowledge through community-building and project-based learning. She quickly discovered that she could use her own “customised education” to solve problems that she truly cared about, which is what self-directed learning is really about. Defined by adult education expert Malcolm Knowles, self-directed learning “describes a process by which individuals take the initiative, with or without the assistance of others, in diagnosing their learning needs, formulating learning goals, identifying human and material resources for learning, and evaluating learning outcomes.” It’s an especially important concept in today’s educational climate, where MOOCs and other supplemental learning tools abound. Before long, we’ll be earning digital badges instead of degrees, and when this happens, self-directed learning will be a critical skill possessed by any student who hopes to succeed. The closely related term “autodidacticism” has roots in the Ancient Greek words autós, or “self,” and didaktikos, meaning “teaching.” The idea is, and always has been, quite simple really: that students should be encouraged to do more independent work. Early autodidacts like Leonardo da Vinci may have been societal outliers during their time, but the Industrial Revolution created more opportunities for people to pursue advanced academic careers and drive their own learning. What we’re seeing now, in the 21st century, is a widespread acceptance of DIY methods of education. The traditional model no longer yields the results it once did, and many of today’s graduates are left high and dry without jobs or– perhaps worse– any real interest in learning. One of the most recent trends in education is that learning environments should cater towards students’ individual needs, goals, and interests. This model adopts the idea of inquiry-based learning, where students are presented with scenarios to identify their own research, questions, and knowledge on a particular topic. At the most successful institutions, students are now being provided with opportunities to “experience and interact” with knowledge, just as da Vinci did, making learning enjoyable and natural. What Makes Self-Directed Learning Effective? According to the Association for Psychological Science, much of the success of the self-directed learning method can be attributed to the cognitive advantages associated with it. In an article published in Perspectives on Psychological Science, a journal of the Association for Psychological Science, researchers Todd Gureckis and Douglas Markant of New York University found that cognitive psychology offers several explanations for the advantages of self-directed learning. For example, self-directed learning “helps us optimise our educational experience, allowing us to focus effort on useful information that we don’t already possess and exposing us to information that we don’t have access to through passive observation.” The active nature of self-directed learning also helps us in encoding information and retaining it over time. But we’re not always optimal self-directed learners, Gureckis and Markant point out. “The many cognitive biases and heuristics that we rely on to help us make decisions can also influence what information we pay attention to and, ultimately, learn.” The researchers note that computational models commonly used in machine learning research can provide a framework for studying how people evaluate different sources of information and decide about the information they seek out and attend to. Work in machine learning can also help identify the benefits – and weaknesses – of independent exploration and the situations in which such exploration will confer the greatest benefit for learners. Drawing together research from cognitive and computational perspectives will provide researchers with a better understanding of the processes that underlie self-directed learning and can help bridge the gap between basic cognitive research and applied educational research. Gureckis and Markant hope that this integration will help researchers to develop assistive training methods that can be used to tailor learning experiences that account for the specific demands of the situation and characteristics of the individual learner. Why Hasn’t Everyone Adopted It? Rodney Skager, a UNESCO researcher, wrote a range of seminal research papers in the 1980s about the importance of SDL. In his book “Organising Schools to Encourage Self Direction in Learners” he stated that whole school change was an imperative to creating SDL. His research showed that only a very rare type of learner, the introspective extravert, was capable of demonstrating the necessary skill set to actively engage in Self Direction: every other type of learner needed to be explicitly taught. Furthermore, schools needed to change in order to increase the opportunities for students to control their own learning through new experiences, a chance to question, to be autonomous, to reflect on their own learning and to search for answers. Later research by authors such as Westwood (1997) and Van Deur and Murray-Harvey (2005) have continued in the same vein as Skager. Decades of research have confirmed that self directed learning must be explicitly taught and requires time for depth of learning and reflection. Fortunately for Haynes and her students, the Brisbane Independent School isn’t restricted to the Federal Curriculum the same way most State institutions are. BIS is just one of many institutions across the globe fighting hard to generate a true love of learning amongst its students. Now that we’ve covered some of the background and benefits associated with self-directed learning, let’s look at some of the steps we can take to achieve it. Below are 20 ways to put yourself first when it comes to your education. 1. Identify your learning goals. You can’t achieve what you haven’t envisioned. Identifying what you want to learn is the first step of the process. 2. Question the significance of things. Make a habit of not taking things for face value and you’ll start to ask questions because you acutally care about the answer. 3. Seek out interesting challenges. Who says challenges are unpleasant by definition? Identify a problem you care about and reward yourself by solving it. 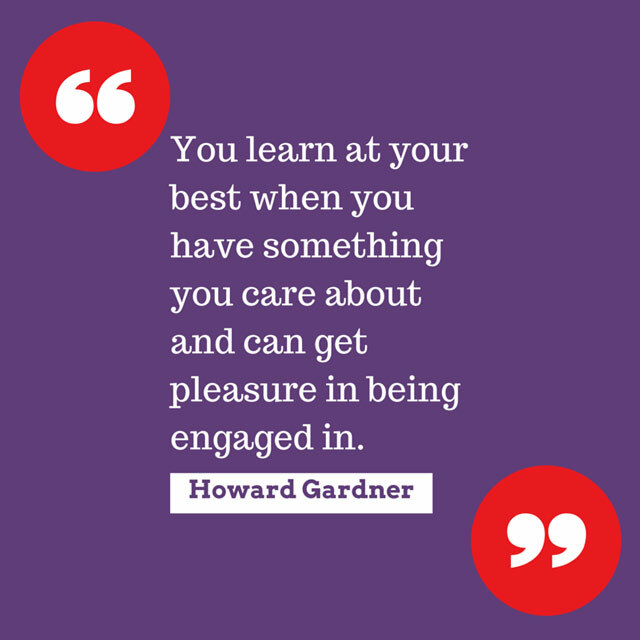 That’s what genuine learning is all about. 4. Monitor your own learning process. Learning is much more enjoyable when you’ve set your own standards. Whether you receive the grade you want or not, try to measure your progress against your own personal learning goals. 5. Understand your own approach. Many of us assume we know our own learning style and preferences, but do we really? Take a moment to consider what format or medium helps you learn best. 6. Use game-based motivation strategies. Reward systems can work wonders when it comes to self-directed learning. Give yourself fun reasons to challenge yourself and work hard. 7. Start with background on a topic. Get to know your topic by reading the Wiki page on it first. It’s important to have context before you dive into details. Intrinsic motivation doesn’t come naturally to everyone, but it can be learned. Help yourself enjoy learning more by collecting interesting facts or planning to share your knowledge with other people. 9. Share your learning with peers and mentors. Knowing you are going to share what you’ve learned with someone else can make a huge difference when it comes to learning. Your attention and memory both receive a boost when you picture yourself relaying new material to another person. 10. Create something out of what you’ve learned. Make a habit of creating something–a diagram, a song, a journal entry– with the new material you’ve learned. Not only will it help solidify the material in your long term memory, but it will also help you look forward to future learning endeavors. 11. Build your own personal learning syllabus. Have you ever looked at a syllabus from a course and wished you had more of a say in it? Now’s your chance. Learn what you want, when you want, how you want. 12. Use time (or lack thereof) to your advantage. We’re all busy, but sometimes this can be an advantage. Take the thirty minutes you have during your lunch hour or post-work session at the gym to complete a “unit” on a topic of interest. 13. Pursue knowledge, not good grades. It’s hard to ignore grades when they seem to mean so much to university admissions staff. But it’s important to keep in mind that they aren’t the end-all-be-all. Grades don’t always reflect how much you’ve actually learned, and that’s what counts in the end. 14. Create your own personal learning record. There are so many great tools out there to help you document your learning. Have some fun with a digital learning portfolio– especially ten years down the road when you’re going through your old notes and projects! It’s one thing to know what you’ve learned; it’s quite another to make it known. Verbalising your achievements can be extremely rewarding, and can help you reflect on what you think you’ve learned vs. what you’ve actually learned. Creating a list of topics to master is almost as fun as crossing them off. Remember to make concrete, easily-achievable goals as well as more general, overarching ones. 17. Practise using what you’ve learned. We all value knowledge we can actually use. Sometimes we need to make an effort to use it, though. Create your own opportunities to use your knowledge and you’ll find the results very rewarding. 18. Value progress over performance. We never stop learning, and that’s one of the many reasons why self-directed learning can be so enjoyable. Countless topics, questions, and problems means countless opportunities to feel stimulated and accomplished. 19. Keep your goals realistic. One of the major killjoys of self-directed learning is created not by the “system” but by ourselves: unrealistic goals. It’s easy to get discouraged when we don’t achieve what we want to. Try to keep things in perspective and create goals you can reasonably achieve. We are collaborative learners by nature. Take advantage of online and in-person communities that will support you through your learning journey and help illuminate your path. Indeed I welcome your thoughts on the self learning steps. bravo to this great wealth of knowledge. Hi, it’s a wonderful article. I am the counselor of an IB school and very often I talk about self-study to the children. I learn through futurelearn.com, Coursera, UK Open university etc. and enrol myself in all course on different genres. Really the articlae is very inspiring. Thank you for this good materials and am very happy about the materials we know that education is the key to every life. This is what most learners are missing! Thanks, i will hold on to this. This is actually helpfull thank you for sharing! I found this useful especially the point you raised that as a self directed learner, we should make realistic goals. Thanks very much, am very much motivated!! Thank you very much for the insight. You left me with the attitude that anything is possible, only the right mindset is needed.